What is a skin treatment? What does it do? Should I have a treatment? What treatment do I book for? what can I expect and will I see a difference? Ever been faced with these questions? If you answered yes we have the perfect 3 great facial brand choices to address all your needs & whats best, there is one for everyone! Sorbet, Dermalogica & Environ have joined forces to provide you with the best facials buffet out there! Take a squiz below & take your pick! 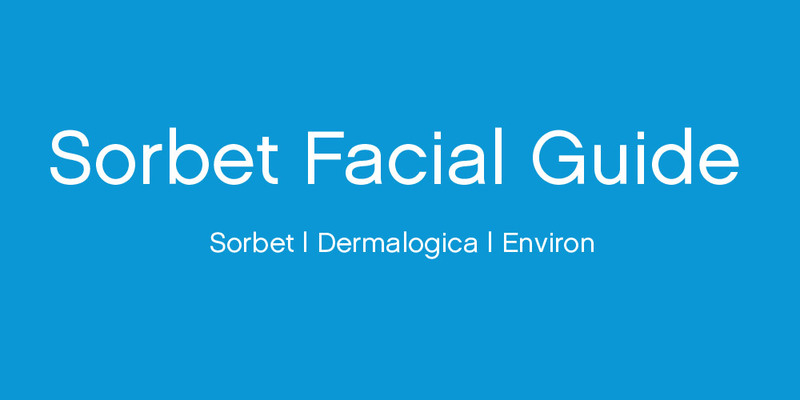 Have you ever experienced a Sorbet Facial? Now is your chance! With so many people to see and so many things to do, why not bump unloved skin to the top of your freak-out list and come through for a Sorbet Grande or Lite facial! The Salon skin 3-in-1 Cleansing Oil will be used. Mixed with warm water, the cleanser will be applied to your face, neck and décolleté. 2. It’s now time for the Sorbet Skin Scan with a Mag Lamp to assess your skin! 3. Exfoliation is the next step using the Salon Skin Daily Skin Polish powder. 5. 18-20 minute Massage – only for Sorbet Grande facial. 6. Mask application using either Sorbet Sachet Masks or The Salon Skin Vitamin Rescue Masque will be applied to your neck and décolleté followed by more massaging on a hand, foot or shoulder massage. 7. “Galvanic / BT Gear” will be performed. This treatment is all about “pushing the product deeper into the skin”. The effect of the treatment will be product specific. The Sorbet Sachet Mask or any of the Sorbet Serums will be used. 8. Serum & Moisturise – A serum based on your skin concern will be applied – Sorbet Age Affect Power Serum, Sorbet Salon Skin Even Tone Corrector Serum or the Sorbet Salon Skin Breakout Correcting Gel. A moisturiser suited to your skin type/condition will be applied to protect and nourish your skin. Your Therapist will give you the option to apply the Sorbet BB Cream. *The above only applies to the Sorbet Grande Facial – The Sorbet Lite Facial excludes massage and masque. Proskin 60 – The ultimate treatment, different everytime. Customised with advanced approach product, techniques and technology. Expert Active: Intensive resurfacing treatment, dramatic results, intensive products, no redness, no down time. Choice of 1 targeted skin concern ranging from Resurfacing, Extractions, Deep treatment or Touch therapies and will only do one. Expert Active includes Resurfacing with BSP & power up treatments. Dermal layering – this is where targeted products are layered onto the skin at the end of the treatment. Each step is customised according to the facial choice, either Proskin or Expert Active. Environ facials are tailor made to your skins concerns and supports the unique Environ Step up philosophy of using the highest effective doses of Vitamin A on the skin. Products are used (expertly formulated by Dr Des Fernandes – the founder and formulator of Environ) to assist with correcting a vitamin A deficiency in the skin. A luxurious hands on treatment – A combination of personal touch and effective doses of skin essential vitamins. The treatment will relax, sooth and restore the skin. The skin will be cleansed and prepared. Your Sorbet skin care therapist will select the appropriate peel for your skin concern. Followed by application of a Vitamin A gel to treat the skin. The skin is then treated to the Alginate Masque which is soothing and cooling, leaving skin refreshed and radiant. The facial will be completed with the Environ Vitamin A moisturiser and sunscreen. NOTE: Individual peels are included in this special, but not peel packages. And there you have it! See our Facial menu HERE & Book your desired facial at Sorbet now!